The introduction of Lime Scooters onto our city streets has felt like a huge "Ouch!'' for many - and not just the people who fall off. While there has been a heavy focus on the people who injure themselves, it's helpful to think in a more integrated way about the implications of the Lime scooters, and electric scooters in general, for wellbeing, fairness and sustainability. This is especially important as the urgency for shaping city transport decisions for health and fairness grows in the face of climate crisis. It requires a re-think of our publicly owned street spaces with a clear vision of how we want those spaces to contribute to wellbeing and fairness. How we get around needs to be radically and urgently rebalanced for a safe and healthy future that also supports a fair go for everyone. By building our urban spaces to privilege driving, the result is that 80% of trips are taken by car or van, and other ways of getting around feel marginalised, dangerous and abnormal. This is killing us and making us sick in multiple and surprising ways. Not only does New Zealand have some of the worst road traffic death and injury rates in the developed world (we're one of very few wealthy countries with a rising road toll), we have also managed to build everyday exercise out of our lives. Lime scooters have mainly been taking up space on footpaths when it should perhaps be road space that they are sharing. Where we would once have walked or biked from place to place, using our food energy to propel us, we now rely on external oil energy to get us where we need to go. Unsurprisingly, this is one major reason we hold the world bronze medal for obesity. Everyday car use is also the fastest growing source of air and climate pollution in New Zealand, causing asthma, lung and heart disease. Having designed our cities this way, we have also made sure that the building blocks of health are unable to be accessed fairly by a large proportion of the population. Anyone who cannot drive, including everyone under 16, many older people, those with a disability or visual impairment, and those who can't afford to own or run a car, is deeply disadvantaged in a city that privileges the car. When you add all those people up, they make up a large proportion of the population. When we look at transport from a wellbeing and fairness and climate change perspective, the solutions that hold the most promise for addressing the multiple problems we've created are, on the whole, old technologies: legs, bikes, trains and buses. For example, the cities that have been most successful at reducing their road toll have done so by shifting people's everyday trips out of the high-speed metal boxes that are responsible, towards ways of getting around that are safest for those who use them and the whole community. These cities are achieving this shift by re-orienting their city streets towards people and wellbeing, levelling the playing field for safe and attractive walking and biking. Proponents of Lime scooters, including the company itself, argue that they also bring multiple benefits, but how do they really stack up in addressing the harms of our current transport system by causing a positive disruption for wellbeing? There are certainly reasonable concerns about the risk of injury from e-scooters, including Lime scooters. The steady trail of Lime scooter riders in Dunedin Hospital's ED is testament to that. But the focus on e-scooter injuries belies the relative injury burden, which is small and, on the whole minor, compared with that caused by motor vehicle crashes. For people who use wheelchairs, those who move slowly on foot, or have visual or hearing impairments, having high speed electric scooters on the footpath feels like a last straw when added to all the other design, use and maintenance impediments that breach their human right to access the building blocks of health. It is emerging that due process at a government level has been bypassed, in the interests of a Lime business model based on the absence of helmets and the use of footpaths. That they are allowed to take up space on the footpath when parked is an added insult to everyone who uses the footpath. By agreeing to these requests at short notice, the government placed the profits of Lime above everyone's wellbeing and fairness. Whether Lime scooters are reducing air and climate pollution and increasing everyday exercise (as claimed by Lime) is unclear and hinges on whether scooter trips are replacing car trips, or instead are extra trips for fun, or worse, replacing more active walking and cycling trips. Without independent surveys of users, and some account of the air and climate pollution caused by the charging process, we can't know. On the other hand, there is a potential for transformative benefits if we manage electric scooters well. The presence of electric scooters in the spaces dominated by motor vehicles adds a disruptive level of uncertainty that may well be changing the way people drive to accommodate unexpected behaviours. This slowing of traffic and change in driving behaviour makes it safer for everyone getting around, including walking, cycling and wheelchairs, even as it feels like an "Ouch'' for people driving. Even better is the way that electric scooters can add to the impetus for re-thinking urban street spaces. To accommodate the widespread use of electric scooters in ways that might contribute to wellbeing and fairness, we will need to move them off the footpath and into the road space. This means re-thinking the design and use of that space to accommodate all the ways of getting around at a speed that is somewhere between walking and driving. Lime scooters are taking up public footpath space, but as this photo shows, in the background, so is a car. Perhaps the most compelling positive impact of electric scooters is that they are clearly fun in a social way for those who you use them. Enhancing a sense of fun and social connection into the centre of our cities is good for mental wellbeing and the economic thriving of a city. But this can't work if it's achieved by taking away the wellbeing of others. 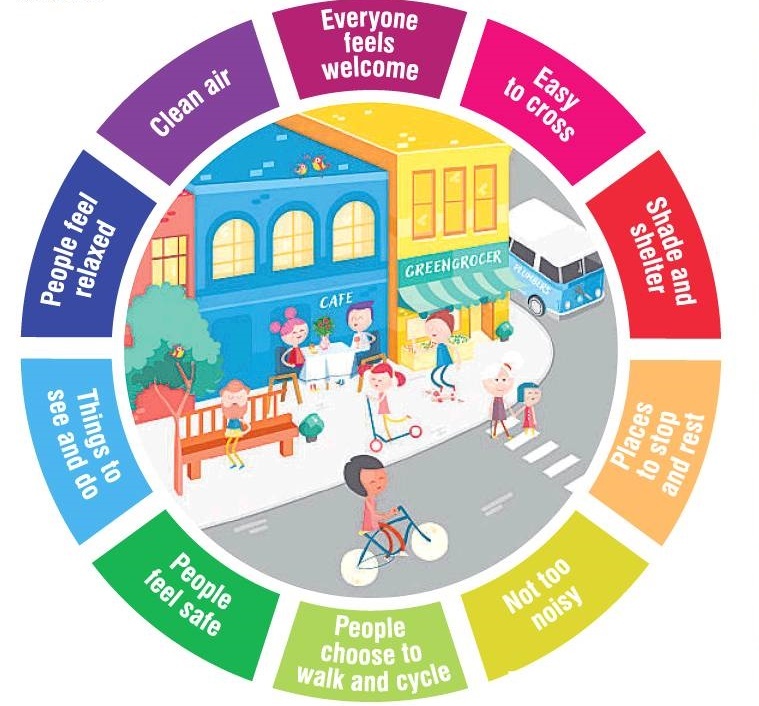 Dealing with the harms and achieving the potential wellbeing and fairness benefits requires a positive re-think of how we share publicly owned street spaces, in the context of a strong, shared wellbeing vision for transport and urban planning investments. Internationally, visions for healthy streets are being created and acted on by city communities and governments. In Dunedin, a public consultation is currently open about the future of George St, where the desired outcomes for wellbeing and fairness of our own communities needs to be centralised. Lime scooters are just one example of multiple new transport technologies that are coming our way. Rather than accepting the arguments of the corporations who relentlessly sell them as the answer to a city's transport woes, we need to assess each carefully against a vision for how transport contributes to a healthy, happy and fair city and shape regulation and physical spaces accordingly. I am pretty sure that not too many trips on Lime scooters couldn't have just as easily been made on foot - without footpaths being crowded with parked scooters and pedestrians being made nervous by their presence. Clearly, the NZTA has dropped the ball in this case: there is no justification for the use of motorised scooters without helmets, and their presence on footpaths is a threat to the safety and well-being of many people, including parents with young children, and the elderly. E-scooters are up there with accursed leaf blowers as largely unnecessary technical developments making money for large corporations, but contributing to lack of normal exercise amongst the general population. The convenience of electric scooters would benefit the over fifties who need to nip down to the dairy, slowly. It would also reduce the chic culture. Too many chic downtown. What happens if the ban for cars, van, trucks etc comes when the hand wringers get their way?, who will deliver your parcels or deliver your furniture?, who will pick up the tab to maintain the foot paths and roads for the buses you use to travel when there is no cars, trucks paying their ruc and road tax?, that's right you will, lets hear your cries for funding then. Fancy walking to work/ meeting in the rain because the bus broke down?, I thought not. To say nothing about the sick, disabled who need their cars or those who get anxiety from crowds from having to ride on the buses crammed with people. Road users have had bicycle lanes foisted upon them, now it's your turn footpath users. Seems the hand wringers/vocal minority are all about rights as long as it only applies to them. I'm 100% not clear of your point but there is a need to reduce our reliance on fossil fuels 1. for the environment and 2. because the supply is finite. We need to think differently and I don't think anyone is suggesting that there will be no means of moving goods in the future (for the record it is my understanding that the cost impact of trucks on the road significantly exceeds their contribution through RUC/ levies). In terms of your last two sentences two wrongs make a right now do they, and I don't think those opposing scooters on the footpaths are the minority. I think electric scooters will eventually prove to be a great asset to cities and people worldwide but the corporate players such as Lime have done their introduction no favours with their corporate malfeasance. Ignoring safety problems and the effect on city pavements of helmetless riders moving at speed has set back the image of scooters and all for the sake of corporate greed. I am a cyclist and if I rode my bike in the same way I would be condemned and maybe prosecuted for the same behavior. All we have to do is provide separate conduits. Like, that's going to happen. Setting competing motive power against each other to reduce motor usage is Battle of Balaclava stuff, off Glen Road. Obstructing the footpath is an offence. I don't know why commercial enterprises which leave objects all over footpaths in order to make a private profit by appropriating public space are not prosecuted.